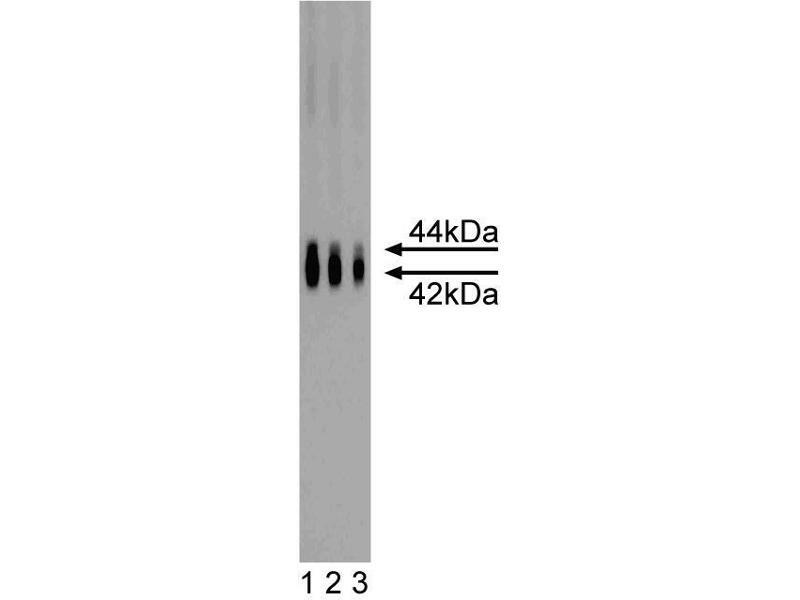 Western blot analysis of ERK1 on a rat cerebrum lysate. 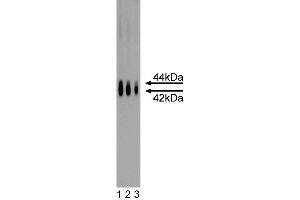 1:4000 (lane 1), 1:8000 (lane 2), 1:16,000 (lane 3) dilution of the mouse anti-ERK1 antibody. ERK1 is expected to appear at 44 kD with crossreactivity reported to ERK2 which may appear at 42 kD. 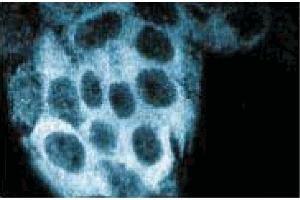 Immunofluorescence staining of A431 cells (Human epithelial carcinoma, ATCC CRL-1555). 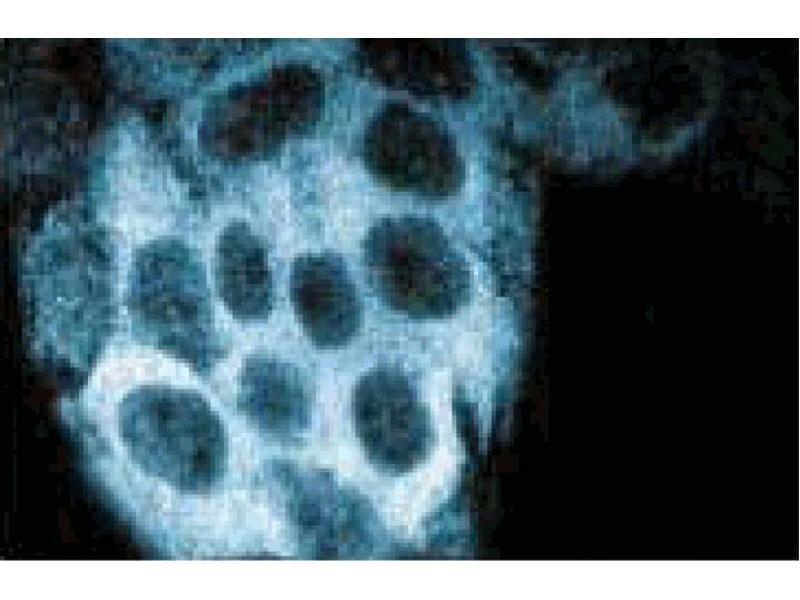 Background The family of serine/threonine kinases known as ERKs (extracellular signal regulated kinases) or MAPKs (mitogen-activated protein kinases) is activated after cell stimulation by a variety of hormones and growth factors. Cell stimulation induces a signaling cascade that leads to phosphorylation of MEK (MAPK/ERK kinase) which, in turn, activates ERK via tyrosine and threonine phosphorylation. A myriad of proteins represent the downstream effectors for the active ERK and implicate it in the control of cell proliferation and differentiation, as well as regulation of the cytoskeleton. Activation of ERK is normally transient and cells possess dual specificity phosphotases that are responsible for its down-regulation. Furthermore, multiple studies have shown that elevated ERK activity is associated with some cancers. 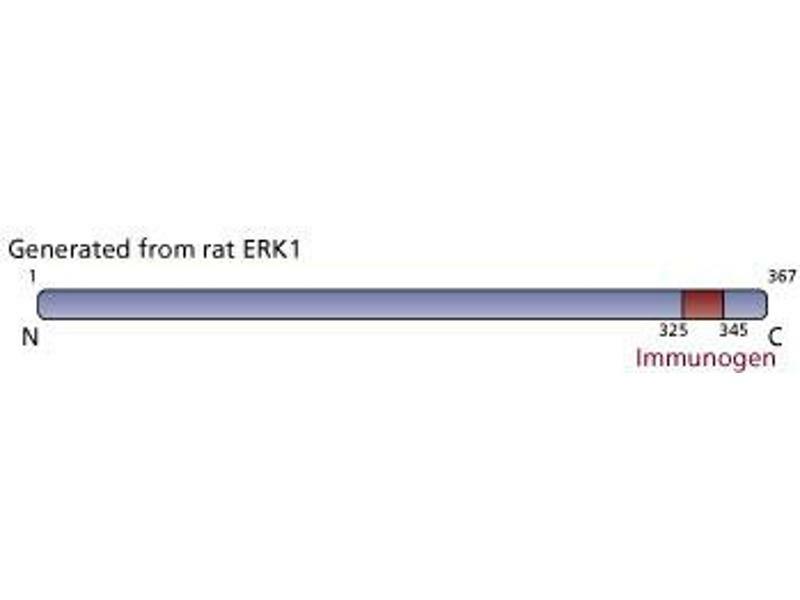 ERK1 is the 44 kDa member of the ERK family and shares 85% homology with ERK2 (42 kD). Storage Comment Store undiluted at -20° C.